Imitation may be the sincerest form of flattery, but as proven by the other empty clichés populating the lyric sheet for “Dare To Be Stupid,” imitation sometimes goes deeper than that. The title track of “Weird Al” Yankovic’s 1985 LP is an homage to Devo—but as the man himself says, “I tried to write a song that didn’t sound specifically like any one Devo tune, but sort of had their vibe.” He tried, and he succeeded: Rather than sounding like any one Devo song, “Dare To Be Stupid” sounds like the band’s first five records played simultaneously, the arch sentiments of Q: Are We Not Men? A: We Are Devo! and Duty Now For The Future playing nice with the smoother synthpop of New Traditionalists and Oh No! It’s Devo. In between is the band’s commercial breakthrough, Freedom Of Choice, and the big hit that seems to be the biggest influence on “Dare To Be Stupid”: “Whip It,” with its honky-tonk guitar fills and naïve, bootstrapping lyrics inspired equally by Thomas Pynchon and Jimmy Carter. What’s subtext in “Whip It” becomes text in “Dare To Be Stupid,” which is one of the many reasons Yankovic’s “style parody” has never been misinterpreted as an ode to sadomasochism and/or masturbation. The only thing potentially masturbatory about “Dare To Be Stupid” is the way the song builds its main joke on a pre-existing one: The “Weird Al” track disposes with the irony of “Whip It,” reveling instead in the frivolity of the modern experience. 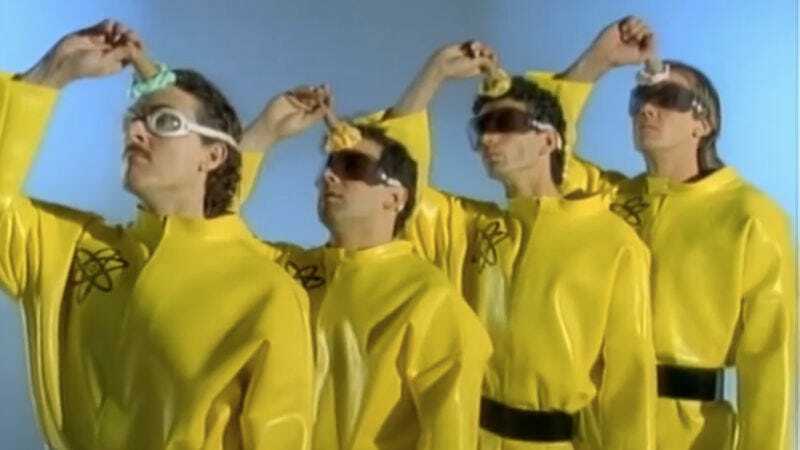 More than Yankovic’s half-swallowed approximation of Mark Mothersbaugh’s voice or the many devolved motifs borrowed for the “Dare To Be Stupid” video, this is the song’s true, Devo-riffing genius. Mothersbaugh, Jerry Casale, and their brothers named Bob spent the better part of two decades satirizing humanity’s scramble to be stupider than its predecessors. “Weird Al” manages that trick in three minutes and 33 seconds and manages to make the act of co-opting ad copy for song lyrics sound totally organic. “Dare To Be Stupid” isn’t so much a Devo parody as it is a transmission from the world predicted by the band, one where mashed potatoes can be your friend (Yankovic’s most obvious tip of the energy dome to the spud boys from Akron) and nothing’s more profound than hollow rhetoric. What a beautiful world, indeed.